Many Small Office Home Offices are actually home based businesses, which is where the "home office" in small office home office comes from. (In the U.S., the share of businesses that are home-based has remained relatively constant over the past decade, at about 50% of all firms. More specifically, 60.1% of all firms without paid employees are home-based, as are 23.3% of small employer firms and 0.3% of large employer firms. Professional, scientific, and technical services (65.3%) - SOHO examples include consultants/specialists in various industries including accountants, lawyers, engineers, etc. But the term SOHO has a broader sweep; it includes everyone who works in a small office, whether as employer or employee. According to fundera, as of 2017 over 3.7 million employees in the U.S. work from home at least half the time, which amounts to 2.8% of the entire U.S. workforce. And the number of of regular telecommuting employees has increased by over 100% since 2005 and continues to gain rapidly in popularity. Whether such small businesses refer to themselves as SOHOs or not, marketers certainly do. 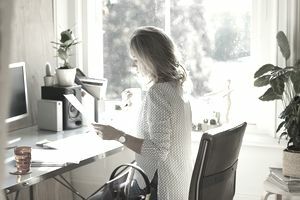 The rise of small office home office businesses has brought a corresponding increase of goods and services designed specifically for the small office home office market, such as multifunction printers and home office desks. SOHO businesses have proliferated with the advent of technologies such as cloud computing and mobile devices that allow home workers to access business information over the internet from wherever they are. An increasing number are virtual businesses, businesses without physical premises. Many professionals, including lawyers, travel agents, accountants, bookkeepers, and financial advisors, now operate SOHO businesses. The increase in consulting businesses over the past several decades has also led to an increase in SOHO businesses. New types of businesses based entirely on the Small Office Home Office model, such as Virtual Assistants, have been created. The numbers of small office home office businesses should increase steadily as increasing numbers of corporate businesses embrace telecommuting; 50% of the US workforce holds a job that is compatible with at least partial telework and approximately 20-25% of the workforce teleworks at some frequency (GlobalWorkplaceAnalytics.com). Coworking is another offshoot of the increasing number of SOHO businesses. It can not only be more inexpensive than having one's own office space but also provide self-employed people more opportunity for networking and sharing ideas that they would get in their individual office space. Why Do People Operate SOHOs? Reduced commuting - People who operate SOHO businesses generally don't have to spend hours commuting to work every day. In addition to not spending time in traffic there are savings in vehicle or public transportation costs as well as reduced expenses on dry-cleaning, child care, etc. There is also the reduced effect on the environment (working from home is a great way to green your business). More family time - Working from home or in a small office allows people to spend more time with their families, pets, and friends. A home office arrangement is particularly advantageous for stay-at-home moms, providing there is flexibility in the hours of work. Less distraction and reduced stress - Working in a busy office can be very stressful, especially since most large companies have long since abandoned the concept of individual offices for employees and have embraced the "cubicle farm" concept, which due to the small workspace, absence of natural light, and lack of privacy many people find confining and depressing. Studies have shown that cubicle workers are the most dissatisfied with their work environments, followed by those working in an open "bullpen" atmosphere. Noisy offices can be very distracting for people who need to focus on tasks with minimal interruption. Comfort - Working from home is much more comfortable than working in a corporate office. If you decide you want to get up and work in your housecoat or pajamas all morning you can. If you decide you want to listen to music you can do so without disrupting anyone else. In your own home or private office you have the freedom to set up your office environment exactly the way you want, rather than having to conform to the cookie-cutter standards of a corporation for everything from office furniture to the generic brand of coffee used in the office coffee maker. Your choice of desk, computer, monitor, and other office equipment can be yours. Being your own boss - Working from home gives you a certain level of independence, even if you are an employee. If you want to catch up on social media during the business day you can do so without feeling like someone is looking over your shoulder. Improved health and well-being - Those who work in a small office/home office have a better work/life balance and are often happier and more productive than those who toil in a corporate office all day. Reduced stress, increased flexibility, and more time for family, friends, and exercise contribute to a healthier lifestyle. However, running your business as a SOHO can also involve considerable cost savings as well.